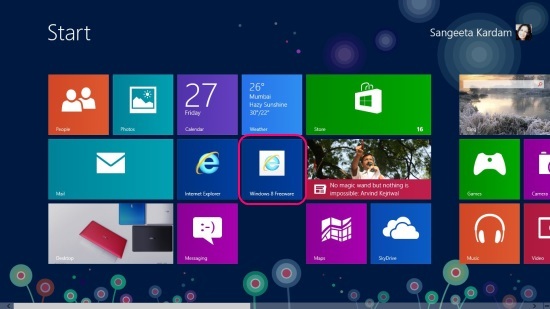 Here is a short tutorial on how to pin websites to Windows 8 Start Screen. Windows 8 allows easily pinning your favorite files and folders to its start screen. But what if you want to pin websites as well? 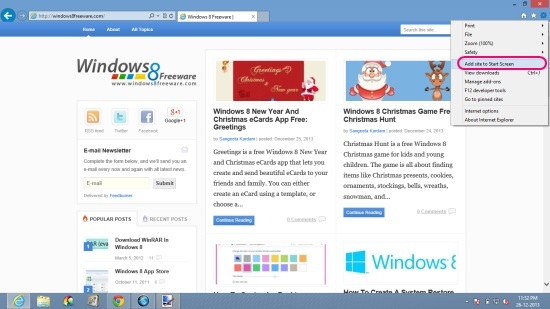 Like Windows 7 allows pinning websites to the Task Bar, Windows 8 allows pinning them to its Metro Screen. And this can be done quite easily. The only condition is you have to use the Windows 8 Internet Explorer app to pin websites to the Start Screen. Any other browser won’t work. So let’s see how this can be done. First of all, go to the Start Screen and launch the Internet Explorer app. Now type-in the URL of the website you want to pin to the Start Screen in the address bar. When the website loads successfully, click on the wrench icon on the top-right corner. A menu would open up. Click on Add Site to Start Screen option. A prompt would appear requesting your confirmation. Click on the Add button. That’s it! The next time you go back to your Start Screen, you would find the icon listed there among the other apps and folder icons. Like this, you can add as many sites to the Start Screen as you want, and can even group them to keep your screen organized. If you want to unpin any website, you can do so by right clicking on it, and then choosing the Unpin from Start option that appears in the bottom flyout. 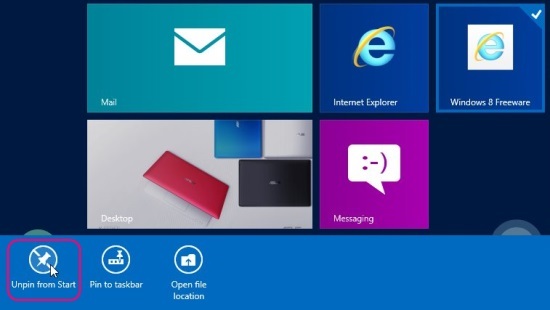 See how simple and easy it is to pin websites to Windows 8 Start Screen! Try it and do share your feedback in comments. If you have something else to share, feel free to leave it in comments. Also check out how to customize desktop windows border color in Windows 8, and how to change Windows 8 lock screen background.